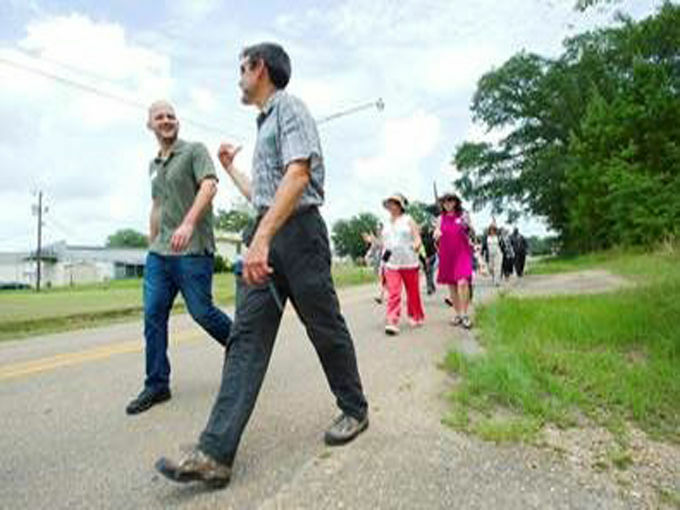 Mark Fenton, right, leads a walk audit. A graduate of the Massachusetts Institute of Technology, Fenton has a mission — to engineer physical activity back into American communities and lives. The season of spring beckons — spring starts tomorrow! — and after a difficult winter that seemed interminable, our thoughts can now turn to spending more time outside being active. But is Butte amenable to that desire? Is it a city friendly to the walker or biker? We’re about to find out. Mark Fenton is coming to town. You likely have never heard of Fenton, but he’s kind of a big deal in transportation, planning and public health circles. A graduate of the Massachusetts Institute of Technology, Fenton has a mission — to engineer physical activity back into American communities and lives. During his upcoming visit, Fenton will not only advise on how to make Butte more accommodating to walkers, bikers and transit users, he’ll connect those accommodations to positive economic impacts. While in Butte, Fenton will teach how to facilitate a walk audit, how people can be more attuned to inclusivity in their work, and how to integrate inclusivity into broader policy and infrastructure decisions. • Does the area have a variety of destinations, a mix of land uses? • Does the area have high-quality comprehensive infrastructure that provides for connectivity to other areas? • When people arrive at the area, are they rewarded or punished for showing up in a vehicle? • Is the area safe and fully accessible for every possible user — all ages, all incomes, all abilities and disabilities? Fenton says the best walk audits include public officials — elected officials and experts from the planning, public works, engineering, economic development and public health worlds. These audits should also include neighborhood stakeholders and advocates, the business community, pedestrian and biking advocates, and people with disability. At his workshop, Fenton will also focus on the principles of healthy community design — such design, he says, leads to routine physical activity for all people. Local examples of inclusive design will be presented — Butte’s new swimming pool and all-abilities playground at Stodden Park will be highlighted. The general public is welcomed to attend Fenton’s workshops — the more who attend, the merrier. If you do attend, bring your tennis shoes. We’ll be walking! winters are like that should be the first item on the list.